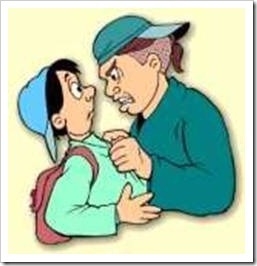 Good parenting is a very important factor in changing the bullying phenomenon. Unfortunately, we live in a world that throws much of the responsibility for kids’ problems and behaviors on the kids, where in fact, although there is no point blaming anyone, parents are still responsible for fixing those problems. Usually, I do not like the concept of “fixing”, but I think fixing is appropriate in this case, because as I believe with all my heart that in the purest, original sense of our existence, we are all kind and warm people who are “damaged” by something along the way, so we fight, thinking there is a threat on us, even if the threat does not exist. The next 10 tips (this post and the next one) focus on the concept of role modeling. Raising strong kids with confidence so they will not become victims of bullying, not even from you, requires courage, self-awareness and self-control. If your kids see you fighting back and strengthening your confidence, they will think this is the norm. It is not easy for people to take responsibly over their life, because taking responsibility requires courage and practice, but when we are weak, our courage is hidden and even if our mind tells us we need to do something, we just cannot. Whenever things are hard and we think we cannot handle them, we tend to blame others or circumstances for whatever happens in our life that we are unhappy about. When we blame, we say that it happens because of someone else – my mom, my kids, my husband or the dog. When we cannot handle the circumstances, we use them to justify ourselves. Justification and blaming are the two survival techniques that kick in when we feel too weak to handle a situation, but when they are “switched on”, responsibility is “switched off”. Bullies mark you as a victim the minute you start justifying or blaming, because these are obvious signs of weakness. It is like walking around with a sign saying, “I am weak. I am a victim. Come bully me”, regardless of who the bully might be. Responsibility helps strengthen your confidence and make sure your blaming and justifying buttons are switched off, so notice when you are justifying or blaming, stop yourself and rephrase. For example, instead of saying, “You make me mad”, you can say, “I feel mad” (please do not say, “I am mad”, because that is labeling yourself). Instead of saying, “I could not have a career because of the kids”, you can say in a very responsible way, “I had kids and chose to put them ahead of my career at the time”. Even when you tell bully stories, instead of saying, “The boss was rude to me”, you can say, “I felt his behavior was rude”, because you do not know the boss was being rude. That was your interpretation – reasonable, but still an interpretation. Whenever you are angry with someone, change your language from “You did this to me” to “I interpreted it as…” or “I felt…” At the same time, be very careful not to confuse responsibly with taking blame. Blaming others damages your self-esteem, but blaming yourself is even worse. Financial challenges are a big reason for bullying. We live in a very materialistic society and when parents feel they do not have enough resources, they appear weak. The problem is not only that they are perceived weak but that they feel weak and inferior when around those who are wealthier. You can see it with kids’ gadgets and clothes at school. Grownups are no different – they continually compare themselves to others and that does not help. People who do not have money must compromise a lot. They compromise on the types of jobs they can do, on working in a bullying environment, on the quality of their relationships, on their location and on many other things, because they do not really have a choice. Managing your financial situation ought to be taught at school or by your parents at home. My dad was never a wealthy person, but he took himself out of poverty to being financially stable with his skills in money management and I learned a lot from him. However, not everyone is lucky enough to be born in a family where someone is a role model for good financial management. Still, you can develop this skill. Having enough money to survive, having financial stability and achieving financial freedom are on a scale and you can learn to move from each step to the next to keep bullies away from you. Be financially stable and you will have to compromise less because you will have more choices. See my Happily Wealthy Family series for more. Personal development is a process that never ends. Even when you think you have reached the top of your success and everything is going smoothly, there is more to learn and more develop. Bullies are people who have not developed enough to understand that power is not something you gain by making someone else feel bad but by developing yourself. Personal development is the art of finding strength within, as most of it is self-discovery. Personal development gurus will tell you that you have all the power inside of you and you only need to realize it. There is something wonderful in this discovery. There is much understanding and acceptance, forgiveness and love, not to mention the extreme power you feel when you know you can control your feelings, thoughts and actions. Personal development can be learned and to do that, there are endless personal development articles you can read and audio CDs to listen to in your car. At any time, you could be working on something you want to develop. Personal development builds confidence and, as I said, confidence repels bullies. If you go through that activity from time to time, you will find you have progressed and have built your confidence over time. You will also notice how other people’s attitude towards you has changed and bullying, if any, has gone down. A big problem of bullies is that they feel bullied somehow, being victims of others they perceive as more powerful in some way. This powerless feeling makes them try to gain this power in a dysfunctional and destructive way. If you talk to bullies, you will hear from them that they are victims and that they have not done anything to deserve the negative actions and attitude towards them. It is as if they are disconnected their behavior from the attitude of others towards them. It is true that sometimes you will be picked as a bullying victim not because you have done anything wrong but just because you happened to be in the wrong place at the wrong time and the bully felt threatened somehow or found you weak in some way, but it is never permanent. It can be changed. Being bullied is sometimes devastating, but there is something you must keep in mind: it is not done against you. Bullies pick whomever they can. They do not do it against you but to gain something for themselves. If there was anyone else around, they would have picked the easiest target. People with a victim mentality (“Everyone is against me”, “No one likes me”, “They all hate me”, “They never invite me”, “I’m a loser”, “I’m no good” or “What could I do?”) are easy targets. No one is born a victim and has a label on their forehead that says, “Come bully me”. The victim mentality puts that label on your forehead, so find your victim thoughts and erase them. The way to do it is to find one example where it is not true. For example, if you have the thought, “Everyone hates me”, find one example where it is not true (“My parents love me”, “My wife/husband/boyfriend/girlfriend loves me”, “My kids love me”, “My brother/sister/friends/teammates like me”) and never say it to yourself (or anyone else) again. Parents who have a victim mentality pass it to their kids in their daily interactions and risk their kids having the victim mentality too. Remember, victims attract bullies. Keep them away from your family by eliminating victim thoughts and feelings. Depression is a general state of weakness and lack of motivation and energy and it makes people very weak in their interactions with others. Depression is a very vulnerable state and everyone feels depressed from time to time. It is very important to distinguish between episodes or short periods of tiredness, disappointment and sadness and full-blown depression, but still, it is important to make a point and recognize when it starts to make sure it does not last long. When people are depressed, their physical strength and motivation deteriorate and their thinking is distorted. It can affect their functions at work and at home. Depressed parents’ performance often drops and that can be used easily by a bully as a weakness. At home, the drop in depressed parents’ functionality creates extra load on the family and makes it harder for them to notice when their children need help, like when they are in a bullying situation that requires intervention. Depression is a very debilitating state and working out the issues when they are “small” is easier than working them out when there is a pile of issues that need addressing. Parents must find the things they do when they feel down and use them as warning signs. For example, some people eat like crazy when they are depressed or they eat a lot of chocolate. If this is the case, notice how many pieces of the chocolate you have eaten and make a rule that if you have finished a whole pack in one go (yikes! ), you need help. Some people have good techniques to get out of a depression, which is really great, because it means they notice they are depressed and do something immediately to change it. For example, go to the movies, call a friend, cook, do some art, play music or watch comedy. Find one of those techniques and force yourself to get out of depression. Depressed parents are not much help to their kids who needs help. Make sure you notice when you are there. Join me next week for the next 5 personal development tips to stop the bully parent.